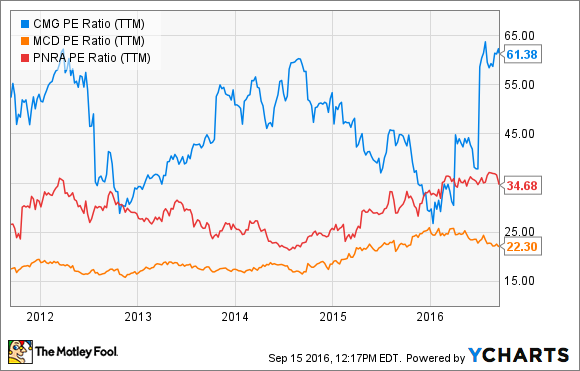 These three charts sum up Chipotle's recent struggles... and opportunities. Shares of Chipotle Mexican Grill (NYSE:CMG) have struggled during the last year. Versus the S&P 500's return of 11%, shares of the Mexican fast-casual chain are down approximately 43%. Even with the horrible year, shares of Chipotle are up nearly 1,800% from its IPO price of $22 a share a decade ago. The biggest issue Chipotle investors face is the continued fallout in the wake of the company's food-safety scandal. The issues started in August of 2015 when Chipotle reported an outbreak of norovirus at one California restaurant that sickened 243 people, and a salmonella outbreak in 22 restaurants across Minnesota and Wisconsin that affected 64 diners. The situation quickly worsened with an E. coli outbreak in 11 states during October and November that added 60 reported cases. The last reported outbreak that year was a December norovirus recurrence that sickened 143 people at a restaurant in Boston. Lucky for investors, it appears that consumer interest in Chipotle's food safety, or lack thereof, has subsided. Google Trends notes that searches for the term "Chipotle outbreak" are only slightly elevated above its pre-outbreak levels, and are much lower than its November highs. Unfortunately, less interest in Chipotle-related outbreaks has not turned into full trust -- at least not with all former diners. A heavily watched metric, comparable-restaurant sales have cratered in the wake of the food-safety issue and have not returned to pre-outbreak levels. The chart below shows the continued struggles in this metric. There's actually a few silver linings in the chart above. First, the second quarter's year-on-year decrease of 23.6% was less of a decrease than the prior-quarter's drop of 29.7%, which points to a slowly forgiving consumer. The second positive is what financial analysts refer to as easy comparables: As a result of underperformance in 2015, specifically Q4, the company will have an easier time posting year-on-year increases. Can it maintain premium valuations? CMG PE Ratio (TTM) data by YCharts. It appears that many Chipotle investors are giving management the benefit of the doubt and are willing to wait out this outbreak-affected period in the hopes the company will return to the growth it once had. In the event poor performance continues, it's possible that narrowed valuations will drag the stock down quickly. Conversely, the stock could return to all-time highs if management overcomes its recent struggles. Chipotle investors should brace for volatility in the upcoming quarters as the stock market will be intensely watching to see if management can turn the company around.